The classic game of Shuffleboard has been around since the 1400’s. Beginning in the U.K., it has gained popularity all around the world. You’ve probably seen a table or two inside a bar or in a killer game room before. Whether you have a large group playing, or just one-on-one, Shuffleboard requires more skill than luck. As the game heats up, this pastime will surely bring out your competitive side! While there are multiple ways to play this simple game, the most common is between two players. The object of the game is to score more points than your opponent using four metal pucks. The layout of a Shuffleboard table is quite simple. The long wooden plank has three scoring zones on each end, and it is surrounded by an area where misfired pucks can fall out of the scoring zones. The table is covered with sand or powder to allow for the pucks to glide across smoothly. While most people use a coin toss, determining who shoots first will depend on each group of players. Each team will have different colored pucks. Along with pucks, you can find everything you need for shuffleboard in our store or online! Check out our shuffleboard accessories here. In a two-player game, each player will have four pucks to shoot. There are a few things each player must keep in mind in order to play the game correctly. Before starting, whoever is playing must stand behind their end of the table to slide their pucks. Players must slide or “shuffle” their pucks to the other side while keeping their pucks on the table. The first player begins by shooting one of his colored pucks and the second player follows. Each player rotates shooting until all eight pucks have been used. In the game of Shuffleboard, aim is everything. To get the most points, the puck must land on the farthest end of the table while remaining on the surface. At the end of the game, the score is determined by counting only the pucks that are closest to the end of the table. If the puck is not entirely inside the score zone, the points do not count. 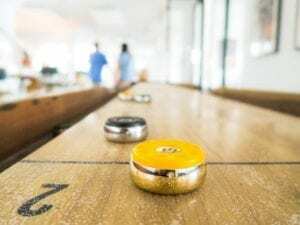 Shuffleboard is an easy game to play and so simple that you can make up your own rules! This is especially true when you have the table in your home! Your table. Your rules. It’s that simple. Interested in having this classic game in your home? A great one to start off with is our Fundamental Shuffleboard Table. This table combines timeless design with precision engineering, creating family fun to last generations. If you want to see our tables for yourself, come to our showroom!